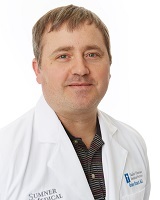 A native of Arkansas , Dr. Stuart obtained a BS degree in Microbiology from the University of Arkansas in 1995. He obtained his medical degree from Saint Louis University School of Medicine in 2000 and soon after went on active duty with the United States Navy as a physician. He completed a residency in Family Practice @ Naval Hospital, Jacksonville , Florida in 2003. Practicing as a family physician, Dr. Stuart's experiences have included taking care of military families on American soil and providing trauma care for US service members in Iraq. Completing his military service in the summer of 2006 , Dr. Stuart moved to Tennessee with his wife and has since begun raising two daughters. He resides in Hendersonville and enjoys outdoor activities and barbecuing.